Leicester boss Claudio Ranieri says he wants to end his managerial career at the club. The former Chelsea manager, 63, takes charge of the Foxes for the first time when they host Sunderland in their Premier League opener on Saturday. "I'd like to stay here for a long time. I'd like to finish my career at Leicester," he said. "I've always laid foundations wherever I've been. I want to say the same here. I'm very happy." 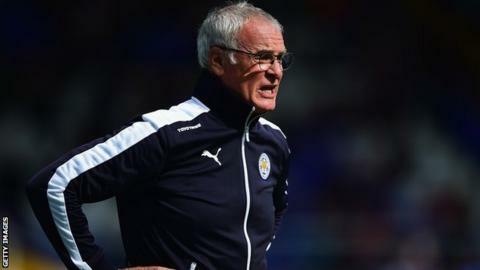 Italian Ranieri, who replaced Nigel Pearson in July, thinks Leicester face a tougher task this season than last to stay in the top flight. Under Pearson, they won seven of their final nine games last term to climb out of the bottom three and finish 14th. "It is more difficult in the Premier League in the second year than the first year," said Ranieri. "They were the best team in the league for the last eight matches. "I saw one man, together. They pressed, played quickly and fought - it was fantastic to watch this. "Slowly I want to show that team - first of all the heart, the fight, and then the quality. "I love English football because it has my character. I am a fighter; I want to fight for every match. In England everybody wants to fight against everybody." Ranieri, Chelsea manager between 2000 and 2004, took over at Leicester after Pearson was sacked because his relationship with the board was "no longer viable".